How many times have you heard…. “Well I remember when I was a kid”? Lots of times right? This is always followed with, “things sure have gone to heck since then”. Or “ kids now a days are so spoiled”, or “they don’t appreciate anything”. The truth is kids are all the same; just the decades roll over. Sure some kids are worse off then we can ever remember our peers to have been. But by and large it is the same now as when we were kids. The only difference is everything is captured by digital cameras in cell phones and in Video feeds from all over the globe. This information revolution is an information overload. At times it is obvious that we know way more than we need to about everything else that’s going on in the world. That’s why I step away from my computer, the TV, and yes my cell phone. Take my son by the hand and he and I take a stroll down the road to our fishing hole on the Meduxnekeag and wet a line. It comes down to each of us to accept this techno world up to our limits and then shut it off! You see each of these new marvels comes with one crucial item built in, an off-switch. Values don’t really change; we just become more accepting of compromises in our time and our relationships with each other. We allow our technologies to control too many hours of thought in each day. In the world of the outdoorsman we allow the GPS to replace common sense. Instead of reading maps and exploring new areas with reserve and caution. We plunge head long into grid quads and “figure it out as we wade through it”. Most of the time missing half the reason we went there. The same is true of our time for family. Put away the gizmos and electro-whatever’s and play with your kids! They are going to be up and grown so fast you’ll soon be saying, “where did the time go?” and it will be too late. The best way to play is one on one. 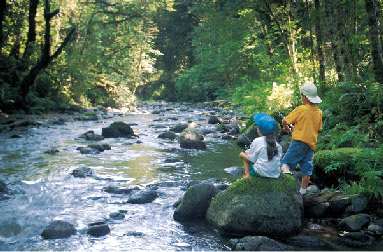 Take your kids fishing and camping, as well as hunting and rock hounding. When was the last time you saw a picture hanging on someone’s wall of the great video game trip they took? Or the last email they sent? Making time is making kids into good adults and people you will like in the future. The only reason not to do this is pure laziness and a good dose of selfishness. The times haven’t changed we have! It all starts simple, you and your kids. Take them sight seeing, first over the Internet and then in person. By embracing the technology in a controlled fashion you exercise your control over it and not it over you. But never compromise when it controls you or your life. Would you allow your car to tell you when to eat or sleep? Why do you allow your TV and Computer to dictate this to you and your kids? One great way to pull your family together is plan trips and events away from the living room and the techno-maniacal world. Get involved in Clubs and Organizations in the community or at a church that promotes the values you hold dear. If a club is not available, start one. I’m sure you are not the only one looking. Just packing a suitcase and taking a drive to see relatives reinforces the sense of oneness in a family. These connections are what keep us from feeling and being lost. This is our spiritual GPS. soul will raise you up. The sun in your face, and the heavens opened wide. And you will know that it is great to be a parent!! Remember always, we safeguard our future through our children. We are their lighthouses in stormy seas. Keep it brightly lit and all is well. The rocks will always be there. The trick is to steer clear and use common sense to avoid them. The shelter from the storm is most appreciated once a storm has been weathered. Calm seas are great but swells arise from Neptune’s back as fast as Shakira can shake it.